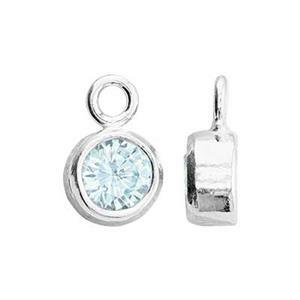 Sterling Silver 5x8.6mm March Bezel Birthstone Charm, 4mm Light Aqua CZ, 1.5mm Closed Ring ID. Facet cut stone has a pointed culet at the back for maximum light refraction. But, the high bezel walls enclose the entire depth of the stone so the culet does not protrude from the back of the setting.